ECU Joondalup SC are hosting a Futsal Tournament in association with apparel partners Macron early next year, all details are below. 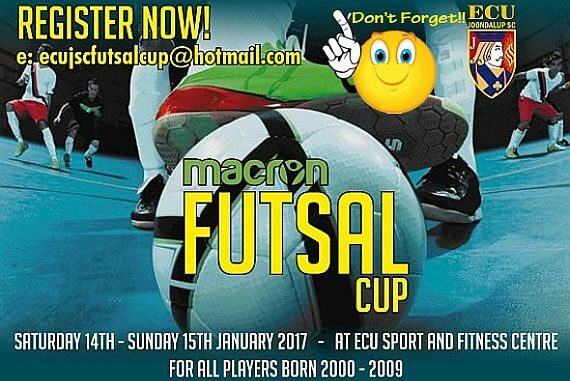 In association with Macron, ECU Joondalup Soccer Club are delighted to announce the ‘Macron Futsal Cup’ at the ECU Sport & Fitness Centre, Joondalup on Saturday 14th & Sunday 15th January. Get together with teammates or friends to create your own team in this 5 v 5 Futsal based tournament. Places are limited in each age group. Teams will consist of a total of 6 players, 5 on field at any one time, 1 GK and 4 outfield players. Normal futsal rules applied.